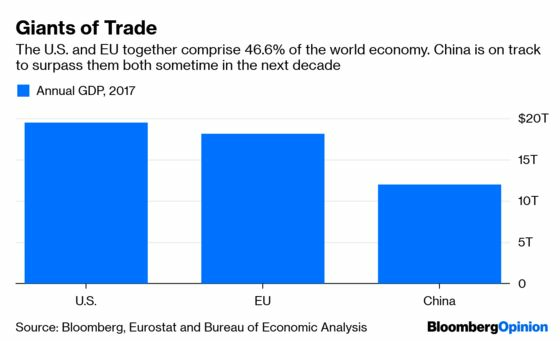 (Bloomberg Opinion) -- If you are looking for the thriller movie that has captured the attention of global markets, this is certainly the trade negotiation between the U.S. and China. It stars an unpredictable leader (President Donald Trump), an impenetrable rival (Chinese President Xi Jinping) and an issue which is typically secretive and hard to understand (trade talks). Equity and currency markets have moved at every whiff of glee or gloom coming out of the discussions. Yet, there is another set of talks few are paying attention to, but which could prove just as important for the world economy. The U.S. and the European Union are set to start their own discussions on industrial tariffs, and in theory these should pose few problems – the two blocs have close economic and geostrategic ties, rooted in a shared belief in democracy and the free market. Normally, the result would be a reduction in the levies and other barriers, something that would be most welcome. But in practice, the risk of a trade war is all too real. The mood music isn’t great. President Donald Trump has called the EU “a foe” and decried its trade practices as “very unfair.” A July meeting with Jean-Claude Juncker, president of the EU Commission, went surprisingly well, but tensions have since resurfaced. Negotiations are meant to start soon, but France is dragging its feet also because of the U.S. decision to withdraw from the Paris climate accord. Trump has set his eyes on the bloc’s 140 billion-euro ($157.3 billion) surplus in goods trade with America, in particular, on Germany’s car exports. In his primitive conception of global commerce, bilateral trade balances are an indicator of which country is “winning” and which is “losing” – not the result of complex supply chains. The danger is that Trump replicates what he has done with China: Slap tariffs on a wide range of goods as a way to extract concessions. This strategy often leads to very dubious gains. Take what happened with Mexico and Canada, where the North American Free Trade Agreement was scrapped, only to be replaced by a nearly identical treaty. It does not help that, unlike many of his predecessors, Trump has very little sympathy for the European project. He openly supported Brexit – before turning on U.K. Prime Minister Theresa May for her handling of the negotiations. He also downgraded the EU’s diplomatic status in Washington – before changing course. Moreover, the U.S. president does not seem to understand how trade policy works on the continent. Unlike foreign investment – which is still the realm of national governments – it is down to the European Commission to negotiate and sign trade deals on behalf of the bloc. In 2017, the Trump asked German Chancellor Angela Merkel if the two countries could sign a trade deal, only to be told this was not possible. In an echo of Henry Kissinger’s famous query on who he had to call if he wanted to call Europe, Trump is struggling to understand that in matters of commerce the U.S. must speak with EU Trade Commissioner Cecilia Malmstroem. A trade conflict between America and the EU would be a severe blow to the European economy, which is already slowing. Companies are already putting off investment, which makes sense if they expect external demand to contract. A further deceleration could force the European Central Bank to reverse course on its plans to tighten monetary policy, as it has already done partly in March. But it could also undermine confidence and send shivers across the financial markets. Still, a trade war could also inflict long-term damage on the U.S. Any further tariffs on EU imports would be paid for by American consumers and would weaken the country’s influence in Europe, which shows already some signs of waning. In March, Italy became the first G7 country to join the “Belt and Road Initiative,” China’s controversial infrastructure program, in spite of explicit warnings from Washington. For the rest of the bloc, growing disaffection with the U.S. could lead to a broader strategic realignment. With the 2020 U.S. presidential elections approaching fast, Trump will be on the lookout for more fights. When the thrill from his administration’s negotiations with China has passed, investors should brace themselves for a new drama.